I offer classes and small-group and private workshops in landscape photography, timelapse, and night photography in the Lake Tahoe, Truckee, and Reno areas, as well as destination workshops around the globe. In this class we will learn how to take two "bracketed" images of identical composition and settings but differing shutter speeds (and thus Ev levels) and then tone them in Lightroom, and move them out into Photoshop as layers, and blend them together with layer masks. This course covers the use of smartphone planning app Photo Pills. Learn how to anticipate sunrises, sunsets, and twilight times, and plan for successful landscape photo shoots of subjects like the full/crescent moon rising, or the center of the Milky Way galaxy in dark night skies. We will work in the Develop module of Lightroom and cover basic toning, white balancing, exposure adjustments, spot removal, cropping, noise removal, perspective correction, and selective editing with the graduated filter and adjustment brush tools. Dive into the wonderful world of modern digital photography with interchangeable lens (SLR) cameras. 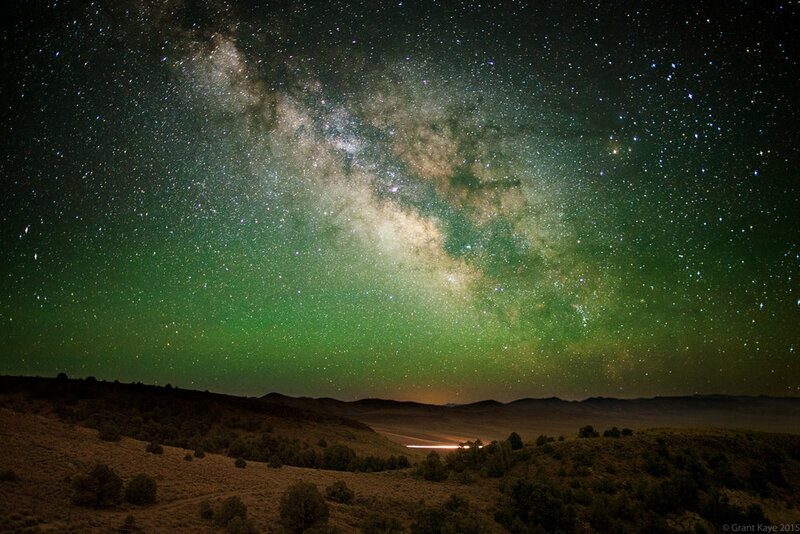 Learn how to shoot photos of the Milky Way in Truckee's beautiful Martis Valley.